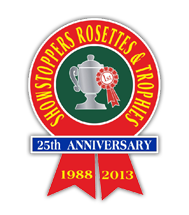 They are one of your most effective marketing tools: once your competitor has left your show with their rosette, it is a constant reminder of a good day out at your Club. Once it is hung up on the Tack Room wall for all to see, it will proudly display the name of your show, what better advertising, especially if it stands out from all the others on the wall. The following pages of our website will show you many fantastically different designs, utilising our wide range of printed ribbons, ensuring that yours will certainly be noticed. We are geared up to producing and stocking aa rosettes and sashes at relatively short notice, it’s always worthwhile giving us a call to see if we can hit your deadline. We are a family business who celebrated our 30th Anniversary in 2017 and you can always be assured of personal service and top quality products such as club, champion and designer rosettes to equestrian and corporate awards. 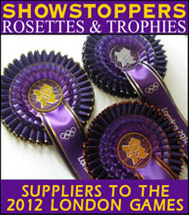 We were pleased to be chosen to produce the Rosettes for the London 2012 both Olympic and Paralympic Games, meaning that our products have been won by champions all over the World as well as throughout the UK, and we have been delighted to introduce our new ranges in 2018. Equestrian disciplines, from Dressage to Horse Racing and dog shows. 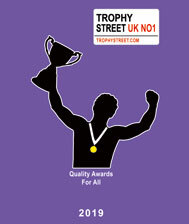 Trophies are typically associated with achievement in Sporting Events, but equally these days they are being awarded more often for Corporate Events, such as Team Building, and Award ceremonies that recognise staff involvement and success. Our In-house engraving services include engraving onto Brass and Glass, and enable us to produce and engrave company logos and images for any kind of event or sporting award you can think of. 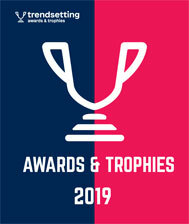 Click on the Brochure icons at the top of this page to browse our online catalogues, which offer you an enormous range of awards to suit all pockets and styles. 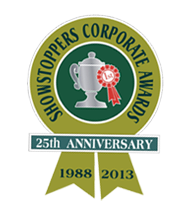 Showstoppers offer Local, National and International Worldwide delivery, so why not contact us today to see how we can make your Event stand out from the rest and run smoothly.